The final item in this list — namely “Skip ahead” — just made its return to the Insider settings for Win10 today. Act Fast, or Lose Your Chance! Microsoft only allows a limited but undisclosed number of participants into the Skipahead wing of the Insider Preview program. 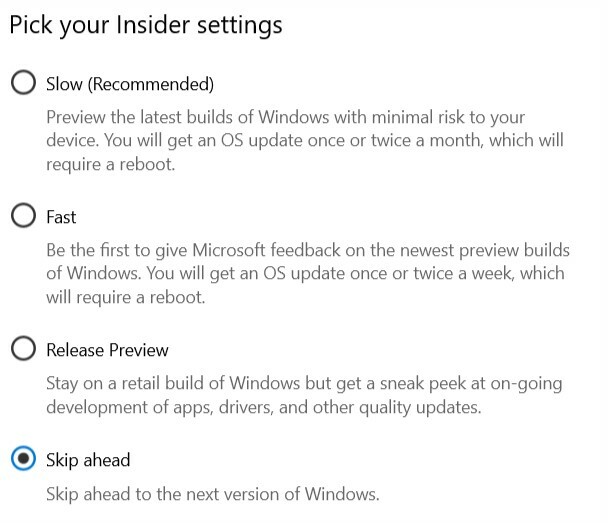 That means if you’re interested in checking out what is popularly called the “Skippy” Insider Preview for Win10, you should visit Settings → Update & Security → Windows Insider Program → Pick your Insider Settings. Then, click the radio button as shown in the preceding screen capture right away. Time’s a wastin’. Get a move on! All signed up, but no Skippy builds just yet. I’ve enrolled my Dell XPS 2720 in the Skip Ahead branch, and it now shows up as such in the Windows Insider Program info in Settings. But alas, as yet there’s no Skip Ahead build(s) to download, install, and play with. That said, I’m forced to interpret the re-opening of Skip ahead enrollment as a definite sign that such builds can’t be too far in the offing. Stay tuned! I acted but it insists on WIF even after registry change. I signed up myself today, so all I can say is “It worked for me.” Sorry it didn’t work for you. I’ve used the registry change in the past myself to get in. I’ve heard widespread reports of WU issues in the Eastern Hemisphere today (including Europe) so maybe you’ve been caught up in that snafu. Sorry for your trouble, in any case.